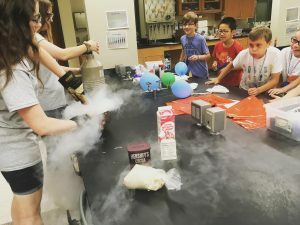 Throughout the weeks of June and July, the halls of Schaap Science Center bubbled with activity as hundreds of children excitedly chattered about newfound lessons as they clutched goodie bags full of goofy but cool science projects. 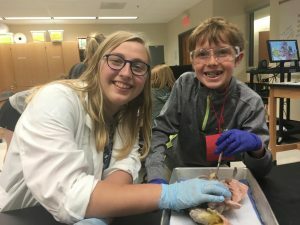 This summer marked the 20th year of Hope College’s annual ExploreHope camps, hands-on workshops meant to stimulate love and learning for youngsters in science, technology, engineering, and math (STEM), and while ExploreHope promises kids a great time, it also provides an outstanding experience for Hope students who use their knowledge and leadership as ExploreHope staffers. With this unique opportunity, Hope students get to flex their creative and scientific muscles and share their enthusiasm for all-things STEM. With this unique opportunity, Hope students get to flex their creative and scientific muscles and share their enthusiasm for all-things STEM. In July, I talked to Hope junior Elizabeth Woodford who served on the ExploreHope staff this summer. Elizabeth is pursuing a bachelor of science degree in chemistry with a biochemistry emphasis, with minors in English and neuroscience as well so she’s quite qualified to teach a variety of different subjects. Plus, she loves getting kids, especially high schoolers, passionate about the sciences. “Also, getting to write experimental design with my coworker Mimi Stalls was a lot of fun, too,” Elizabeth added. Any given day at ExploreHope is bustling with hands-on learning. The 50+ camps typically run in three-hour time blocks in either the morning or afternoon, with a few all-day camps thrown into the mix. The teachers, or counselors, lead the kids through entertaining and engaging activities. Those activities are designed to explain a particular field of science as well as to get kids — elementary to high school — excited about that field. New camps are created each year, too — Tinker(bell) Engineering and Experimental Design being the newest addition in 2017 — meaning there is something STEM for every camper. 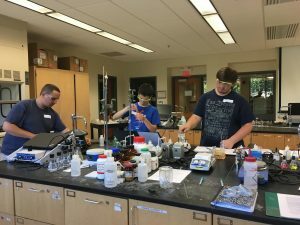 While younger kids focused on science basics, high school camps are more oriented toward preparing the participants for college-level science classes, specifically labs. They conduct actual experiments and, in the end, walk away with experience and knowledge under their belts, making them better prepared for their freshman science classes when they reach college. The children watch their Hope teacher blow on a wok containing the nitrogen, then “ooh” and “ahh” as they see the teacher’s breath create a cloud of ice crystals. Other popular activities at ExploreHope include field trips to the veterinarian, creating slimes and polymers, building lego robots, and performing flame tests on powders. When the week draws to a close, campers leave with a packet that reviews everything they did that week — including directions to redo some of the experiments at home (except the one with flames involved!). Overall, ExploreHope is a formative opportunity for any kid — elementary to college — to play with slime, “blow” things up, or even design their own labs. In general, learning and loving science is what ExploreHope is all about. Read more about ExploreHope camps on the Hope website and in The Holland Sentinel story. Next Next post: Are you asking these 6 questions on your college tours?